Join me on my journey as I try out local produce delivery services in the Bay Area. I have been subscribing to a different one each week. After ten weeks I will provide a comprehensive ranking. Last week I tried out Full Belly Farm, which required a 4-box minimum commitment and one size box to choose from. I looked forward to see what this week’s box entailed for my Eatwell Farm review! The family owned and operated Eatwell Farm has grown produce and harvested chicken eggs for over 20 years. Located outside of Dixon, CA, this year-round operation spans across 105 acres of land. Over 85% of produce included in my Eatwell Farm review box originated from their farm, with the remaining items sourced from other farms in the area. Eatwell Farm hosts many members-only events including Strawberry Days, Pizza Oven Days, and an Annual Lavender Harvest. I also stumbled upon The Nest, a lotus-belle tent situated amongst the orchards and lavender field that can be rented out for a night of rest and relaxation. Eatwell Farm made note of the fact that CSA programs may be daunting for the receiver since they tend to include unknown produce, commonly from the green, leafy category. In order to ease the unknown, the farm’s website provided in depth information on each produce item. The Farm included a variety of recipes to sift through plus storage tips to lengthen the life of my produce. By providing thorough and educational material, members are encouraged to use the produce they receive, instead of items ending up wilted and in the trash. Eatwell Farm provides members with a variety of high quality produce, educates them about locally produced food, and helps them find enjoyment in cooking and eating at home. For my Eatwell Farm review, I was able to choose from a variety of options. There is a minimum commitment of four deliveries, with the ability to cancel at any time after that. I opted for the auto renew and chose the family box every other week at $124, averaging out to $31 per box. I could also select to push back the delivery at any time if I could not adhere to the pick-up schedule provided. There was no item customization available for my Eatwell Farm review, similar to Full Belly Farm’s produce box. 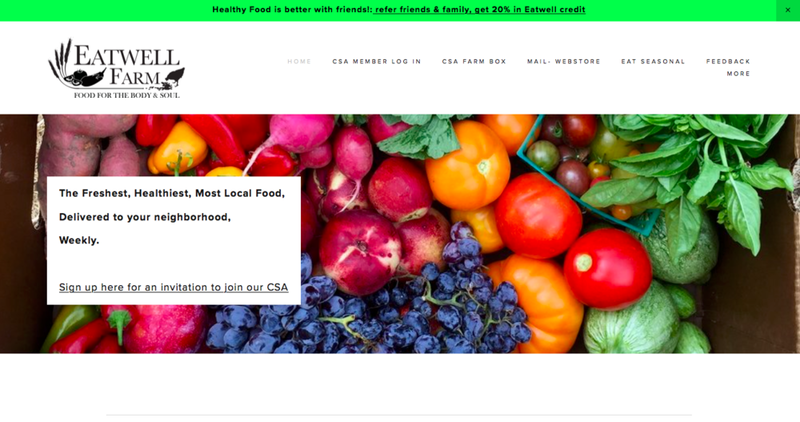 Each week the website was updated with the produce of the week, how to store it, applicable recipes, a proposed shopping list, and a link to their weekly newsletter. I should also mention that Eatwell Farm provided a ton of add-ons in a variety of categories, including kimchi, apple cider vinegar, lavender, essential oils, natural body products, and their Drinkwell Softers, lacto-fermented soft drinks made from whey, organic sugar and distilled herbs such as lavender, lemon verbena or rose geranium. I received an email confirmation once I placed my order which provided me with loads of important information about my purchase and detailed protocol pertaining to my pick-up. For my Eatwell Farm review, I had the option to pick up from a variety of locations throughout the Bay Area and Sacramento. I made sure to select a location that was convenient for me. I had zero trouble with this process, thanks to the farm’s communication. The contents of the produce box. Upon arriving at my pick up site, I located the box with my name on it, signed the sign-out sheet, and transferred my produce from Eatwell’s box to my cloth bags that I brought from home. Eatwell Farm recycles the wax boxes they use to transport the produce from the farm to the pick-up site. As I unpacked the produce I saw a print-out of the newsletter, which listed all of the produce that was included as part of my Eatwell Farm review box. Sugar Snap Peas: I huge handful that were round and thick, with pods full of peas. Turnips: About eight, with their aimlessly beautiful yellowish green leaves still sprouting from the roots. Fennel: Two bulbs - fennel has never been a go-to for me, but I’ll see if I can work it in to something for the week. Bok Choy: A nice short bundle which will be a great side dish to a future Asian-inspired dinner. Leeks: Two very large, very tall leeks - I can’t wait to melt these down in some oil on the stove. Green Garlic: Three fragrant stalks with small bulbs at the bottom. Dill: A well-sized bunch - I plan on looking up a recipe or two to incorporate this herb as I do not normally cook with dill. Chard: With dark green leaves and red stems, I always love exploring the flavors that roasted chard provides. Red Russian Kale: What first caught my eye was the purplish hue to these leaves, as I most commonly see the dark green variety in the stores. Stir Fry Mix: An enormous bag of mixed greens of many different shapes and textures that is sure to last me several meals. Strawberries: Praise strawberry season! These ruby reds looked juicy and I hope that I am able to keep my hands off of them before I use them in a dish. Carrots (from Terra Firma Farm): Very cool to see Terra Firma Farm partner with Eatwell on their carrots - I plan to do some roasting with these beauties. Cilantro: A huge bunch that I will use over and over and over again throughout the week. Nothing like a sprinkle of extra antioxidants to get me through the day. I used a few of the storage tips that I gathered from the website and newsletter, filled up two mason jars 1/4 of the way with water, and placed my dill and cilantro inside, one in each. I planned to cut off a few leaves here and there to season upcoming dishes with, so I wanted to ensure I used a proper storing method to attempt keeping these herbs strong. The strawberries found their way into a vegan berry crumble, recipe below, and most of the remaining produce was incorporated into a stellar veggie stir fry that was so simple, so quick to assemble, and so flavorful. There were a ton of greens in this box so I was able to stretch them across multiple meals. I absolutely love the creaminess and sweetness roasted leeks provide with no dairy required. I sliced and sautéed them for several minutes until they released some of their juices. I then added sliced potatoes, seasoned with salt and pepper, and let everything simmer in vegetable broth for about 30 minutes until the potatoes were easy to break with a slotted spoon. I transferred 1/2 of my soup to a food processor and processed it until smooth. I then poured my blended soup into the original pot so there were still some nice chunks of potato and leek to bite in to. The Red Russian Kale leaves were separated from the stalks, ripped up into pieces, and tossed with just a touch of avocado oil, paprika and salt before they were baked in the oven for a few minutes. Upon browning, I removed the leaves and let them cool a bit before adding them as a crunchy topping to my bowl of soup. Tons of flavor, tons of creaminess, lots of crunch, and all very vegan. I must say that I love a healthy dessert, the sweet flavors originating from fructose (the form of sugar found in fruit) instead of conventional sugars. I have said it before and I will say it again: I enjoy a shift in flavor profile from salty to sweet at the end of my meal. This crumble recipe is satisfying yet it will not weigh me down. It could not be easier to make: no need for any special electronics, plus it is extremely customizable depending on one’s taste for certain berries and nuts. This dessert is decadent in the healthiest possible way. In my opinion, nothing beats a good sauce. A simple stir-fry including turnips, turnip greens, carrots, bok choy, sugar snap peas, and the farm's stir fry mix over plain quinoa transpired into a meal to remember as I mixed up a dressing made of extra virgin olive oil, tahini, raw honey, lemon juice, salt and pepper. I really want to bottle this up and use it every darn day! I felt well informed and prepared once I received the produce box for my Eatwell Farm review. The weekly newsletter contained a great deal of information including a list of weekly items, recipes, and tips on storing my fruits and vegetables. There was a ton of variety in my box, mostly in the form of greens and herbs. I opted in for the text communication from the farm, and I received a text reminder about my pick up that morning. I executed my pick up without a hitch. Email communication was thorough as well. My produce arrived fresh and there were no surprises. Helpful shopping lists and a multitude of recipes saved a ton of preparation time, especially beneficial to those looking for a quick way to cook with their produce. Check out my final ranking of all ten delivery services found here!